Wintertime in the Northeast can get pretty drab. I know it's pretty tempting to want to grab some fresh cut flowers from the corner store, but why not consider some winter blooming plants (with roots)! Over the years, I've enjoyed blooming flowers not just in the spring and summer—but all season long. The key is finding the plants that like to flower in winter, or in some cases, like to bloom all year long. Here are fifteen of my fresh picks. You now can find all sorts of jasmine varieties that have a most intoxicating smell. This variety, Arabian jasmine (Jasminum sambac), has a double flower, or flower-within-a-flower. I like to include the Anthurium because like the Poinsettia, it is the colorful bract that people often mistake for the flower. However, the flowers are contained in spirals along the protruding spadix in the center. Regardless, the Anthurium often keeps its color and its bracts for a particularly long time. Begonias are quite a diverse genera, numbering around 1,800 different species and countless cultivars. I was lucky this past winter to have two of my begonias in full bloom. The desert rose (Adenium sp.) is a striking succulent. They prefer it sunny, dry, warm—and particularly don't mind a little neglect. My desert rose had lost all its leaves two winters ago, and then got a bout of mealy bugs, but after all of that, it bounced back with vigor and began to put out multiple blooms the following year—a testament to its resiliency. There are many different varieties of lipstick plants, including this one—Aeschynanthus radicans—which have stunning flowers that emerge from red to black calyxes almost randomly throughout the year. The Bleeding Heart Vine (Clerodendrum x speciosum) can be considered an ever-bloomer—as this one always seems to be displaying its showy pink flowers throughout the year. Popular in winter markets, Kalanchoe blossfeldiana is one of the more affordable winter-blooming plants around. Once the flowers are finished blooming, you can dead-head them and you'll be surprised how quickly the plant may bloom again. Cyclamens are commonly sold in winter markets, particularly for their showy blooms, but know that this is one of those Goldilox plants. It doesn't like to be too wet or too dry. Amaryllis is a popular bulb plant that comes in a number of hues (red is quite popular) and pops up with a showy bloom over the holidays. You likely have some fond memory of African violets (Saintpaulia ionantha), as they were at least quite popular flowers in my great grandmother's home growing up. If cared for correctly, African violets will likely bloom almost all year long. Thanksgiving and Christmas cactuses (Schlumbergera truncata) are, as their names suggest, programmed to bloom no-fail around their respective holidays. While they are blooming, it's important to keep them moist, as they are one of those rare cacti that prefer more of a moist environment. Hawaiian wedding vine—once called Stephanotis floribunda has now had a change in genus to Marsdenia floribunda, but does not change it's heavenly scented jasmine-like flowers. String-of-pearls (Senecio rowleyanus) is a succulent within the Aster family, which is easy to see after you see its small but showy aster-like flowers. Crown-of-thorns (Euphorbia milii), aptly named for its thorny stems, is an ever-bloomer that is highly recommended. Just don't get the milky sap on you! Also in the Euphorbia genus, Poinsettia (Euphorbia pulcherrima) is bred for its showy bracts, which are modified leaves which are often mistaken for flowers. As a matter of fact, however, it is their Inconspicuous yellow flowers that are actually blooming while the bracts get all the attention. Jasmine typically blooms in the spring through fall, but it also can bloom in winter, and is often sold in stores during the winter months in bloom. If you want to produce winter blossoms in your home, you will need to give your jasmine a period of rest in the fall. Nights should be dark, as any light—like streetlights or indoor lights—can affect this. Once it blooms, prune it back quite heavily, which in general is a good practice since jasmine has a tendency to grow unwieldy. Anthurium is native to Colombia and Ecuador, and is primarily an epiphytic species growing in moist, humid conditions. The inflorescence grows on a spike emerging from what some would consider the flower, but its really a palette-shaped spathe—often in the hue of red and pink, but you can also find them in white, orange and green. Begonias come in a variety of species and though they all have showy, pink flowers that bloom in winter, most people get Begonias for their leaves, which come in all different shapes and colors. Desert Roses have bright, showy flowers that are quite spectacular. They can bloom any time, but I've found that mine bloom through the winter. Shortly after, the plant can become pretty bare, dropping leaves, until there is new regrowth in the summer months. This past year, I placed my Desert Rose outdoors during the summer and it began sprouting plenty of new leaves. Once the temperature started to drop, I brought it indoors and two beautiful flowers began to emerge. Lipstick plants in the home often like to be in a partially shady area. Since these were originally epiphytic plants, the best soil would be a mixture of sphagnum and potting soil. The plants prefer a warm, humid environment with some decent light. This mimics more of their native environment, tucked away in some damp forests. To encourage buds, keep them at 65° to 70°F, though in winter, they can definitely be cooler and drier. After they flower, it's suggested to prune their stems back to a height of 6" to encourage new growth. This is a beautiful climber, often called either Bleeding Heart Vine or Pagoda Flower. When given partial or full sun, it'll toss out some showy pink buds that will last for several months. 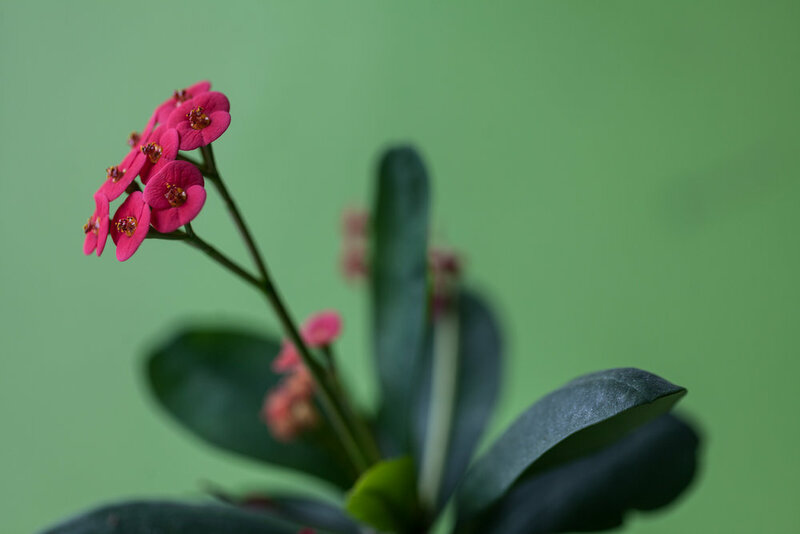 The blossoming Kalanchoe is a favorite plant sold in stores around wintertime, featuring blooms of all different hues—red, yellow, pink and orange. They are probably one of the most affordable flowering plants but can quickly look scraggly after they bloom. The key is dead-heading them after their bloom and chances are they'll bloom again shortly thereafter. These plants are native to the Mediterranean and typically bloom from December through April. Most people toss away the plant after it blooms because it tends to lose all of its leaves. Don't do this! The plant is only going dormant. Water it now and again during this period and as soon as cool temperatures start up again in the fall, the plant will begin to revive again with regular watering. Amarylis bulbs will bloom year after year if you repot per the specifications of the plant. Flowers will start to appear around 6 weeks after and if you want to extend the life of the showy flowers, all you need to do is snip off the stamens. After flowering, slice off the flower stalk a few inches above the bulb but keep the leaves. You can keep the plant growing by giving it a regular fertilizing schedule and good moisture. In around October, remove the bulb from its soil home and let it sit in a cool, dry place for two months before replanting. African violets are one of the easier flowering plants to grow, particularly because they adjust well to the drier air that is often found indoors. I have mine close to a north-facing window, which it seems to do well in. They like sunnier locations, but a south-facing window would be far too hot for them. These are relatively compact plants, but you can also find some trailing varieties. My mother had beautiful Christmas cacti in her home, and these reliable bloomers are easy to come by, particularly in the winter months. There is a secret to good bud production, which involves temperature and light control. In the daytime, the plant prefers bright light and night temperatures should fall between 55° and 65° F. You'll want long nights starting in September—around 13 hours or more of continuous darkness—all before this plant flowers. M. floribunda is a popular plant for weddings, as it name suggests. It has long tubular white flowers that have a fragrance very similar to jasmine. It's often sold while its blooming because indoors, it is hard to get it to bloom year-after-year. Don't let this plant slip below 59°F. It likes to be kept in a sunny spot, but with no strong afternoon sun. This beautiful succulent is a member of the Asteracea family and prefers well-drained soil for succulents. It doesn't mind being in slightly cooler conditions in the winter, around 50°F, but I keep my plant near a drafty window and it still puts out great flowers. It's not atypical for these plants to die back after a few years, so if you see signs of that, just make a cutting and restart the plant. The Crown-of-Thorns gets its name from its thorny stems. The plant also exudes a poisonous white latex when broken, which you should try to avoid getting on your skin. Cuttings are made at the tip, and the flowers of this plant, much like the Poinsettia and the Anthurium, are relatively inconspicuous but are surrounded by petal-like bracts—often in red or yellow hues. The Poinsettia's flowers are actually the inconspicuous little yellow buds that are subtended by the red, white or pink bracts. These plants are often tossed after the holidays, but you can continue having the Poinsettia around your house. If you take care of it, it may even turn into a shrub. The key to taking care of this plant is to keep it warm. It hates drafts. And it needs to be in a sunny area, but kept away from too much hot afternoon sun.